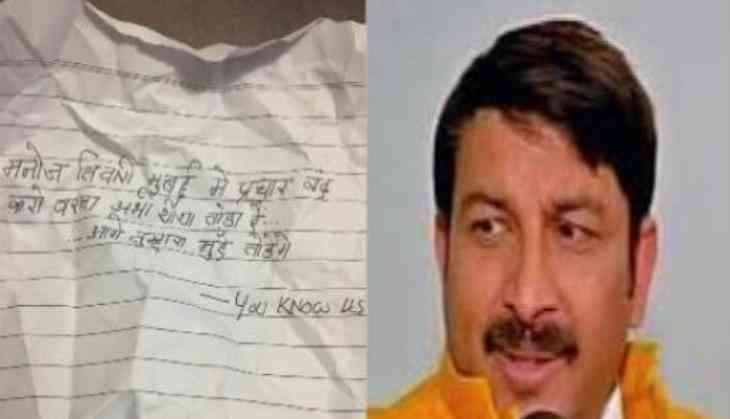 Following the attack on his car by few unidentified men in Mumbai yesterday, Delhi Bharatiya Janata Party (BJP) chief Manoj Tiwari on Friday hit out at the opposition and said such incidents cannot discourage him. "This is a very strange incident. But the people are supporting me here. The opposition must have done this. They are trying to threaten me, but this cannot discourage me," Tiwari told ANI. "We have filed a complaint with the police. Now, they will investigate the matter. I live in Mumbai. I have a home here and to carry out such a thing in front of my house is a very serious issue," he added. Tiwari also vowed that he would give his best to ensure the BJP's victory in the BMC polls. The untoward incident took place at around 5 p.m. on 16 February when Tiwari was about to leave his residence. Tiwari, the Lok Sabha member from Delhi North-East, has been campaigning for the party in Mumbai for the BMC polls scheduled to be held on 21 February. The results will be announced on 23 February. Sorry to play spoilsport, but what happens to India if Virat Kohli fails?